One year ago, DIM was inaugurated into the Pacific Cinematheque's programming calendar with a double bill of Jean Genet's Un Chant d'Amour and Frederic Moffett's Jean Genet in Chicago. 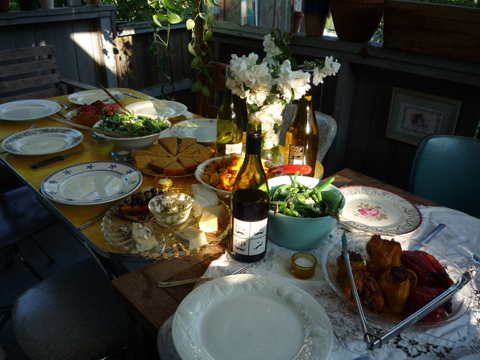 Since that balmy summer evening I have been blessed with the company of out of town filmmakers, back porch dinner parties, sailing trips, veggie oil reconaissance missions, mural paintings, outdoor projections, and late nights at La Bodega. It has been precious and memorable. People often ask me why the evening is called DIM. Dim is the quality of light in Vancouver, the secret magic and wonder that we experience with the obscure and abstract, the texture of the theatre, and the quiet that is inspired by the dimming of lights. Today I was flipping through James Broughton's 'Making Light of It', which I was given almost exactly 11 years ago for my birthday, and I came across this quote to deepen the phenomenon: Movie images are dim reflections of the beauty and ferocity in mankind. How's that for an anniversary present! What more could I want. Thank you so much to all of the filmmakers, distributors, curators, Pacific Cinematheque staff and volunteers, press, and co-presenters that have supported DIM. I will do my best to list everyone below. I would like extend my warmest affection to Gabriel Saloman, Kika Thorne and Cheyanne Turions for their enduring enthusiasm, support and collaboration, and to Scott Nelson for developing this website with me. And my highest regard goes to The Pacific Cinematheque's Director of Programming Jim Sinclair for having faith in experimental cinema and giving me this special opportunity. ARTISTS || Frederic Moffett, Jean Genet, Hannah Miami, Daniel Barrow, Cam Matamoros, Shana Moulton, Benny Nemerofsky Ramsay, Goody B. Wiseman, Kevin Hegge, Leah Glushien, Maiko Tanaka, Emily Vey Duke, Cooper Battersby, Bill Daniel, Shauna McGarry, Tammy Rae Carland, Naomi Uman, Dulcie Clarkson, Eileen Maxson, C.Ryder Cooley, Zoey Kroll, Sativa Peterson, Vanessa Renwick, Sarah Hanssen, Peggy Anne Berton, Marc St. Aubin, Hooliganship, Crystalbeard, Takeshi Murata, Adrian Freeman, Blu, Bruce Bickford, Ola Vasiljeva, Paper Rad, Emanuelle Kabu, Philippe Blanchard, Jeff Kricshun, Shayne Ehman, Setch Scriver, Arlea Ashcroft, Andrea von Wichert, Deco Dawson, David Lopan, Shawn Fulton, Kyle Ketchemonia, Alex Larose, Terryll Loffler, Tricia Martin, Terry Mialkowky, Shannon Jardine, Mike Maryniuk, Solomon Nagler, Diane Ouellete, robert.daniel.pytlyk., Alex Rogalski, Daichi Saito, Vanda Schmockel, Katherine Skelton, Cam Woykin, Adrian Blackwell, Christian Giroux, Daniel Young, Miles Mogulescu, Andy Harvey, Moira Simpson, Elizabeth Walker, Stan Douglas, Paul Wong, Jeanette Reinhardt, Gina Daniels, Gary Bourgeoise, Lorna Boschman, Persimmon Blackridge, Sid Chow Tan, James Diamond, Aaron Chan, Lulu Gurney, Carmen Pollard, desmedia collective, WorkingTV, Projections, Vanessa Renwick, Daniel Menche, Chris Welsby, William Raban, WKBW, Tony Conrad, Paris Henderson, Chris Ernst, Marc Moscato, Terry Cuddy, Esther Johnson, Critical Art Ensemble, Kelly Spivey, Julie Perini, Staphanie Gray, Real Dream Cabaret, Meg Knowles, Gabriella Citriniti, David Gracon.